The last time Lew and I visited Chicago we shut off our phones and purposely neglected to take many photos. It was nice having some time for ourselves to enjoy the city! We binged on the best cuisine, saw the Tony award winning play-Hamilton, and enjoyed being tourists in such a historic downtown. We were also pleasantly surprised by the variety of kid-friendly activities the city had to offer. Though we loved the break from our busy lives back home, we couldn't wait to visit again with the boys! Last week we finally got a chance to head back and were so excited to be staying at the InterContinental Hotel Magnificent Mile. I feel like this hotel was made for us--It's convenient to so many amazing restaurants (like Michael Jordan's Steakhouse. YUM. ), shopping + some of our favorite Chicago landmarks. It was a dream, and the perfect place to spend a family vacation. Our entire stay was magical. There was so much to do and see without even leaving the hotel. We got the opportunity to take a guided tour around the property and admire all of it's ornate, historical beauty. And if the architecture & amazing views weren't fulfilling enough, swimming in the junior Olympic-sized pool on the14th floor really put the icing on the cake! Other than exploring the city and relaxing in our room, we ate, ate and ate some more! The InterContinental Chicago has such amazing restaurants. We especially enjoyed Michael Jordan's Steakhouse. From its variety of succulent appetizers and entrees, to its world class service, it goes down as one of our favorite restaurants! It was a special trip and we will never forget it. You can see more of our stay on my IGTV linked below and you can learn more about the InterContinental hotel here. 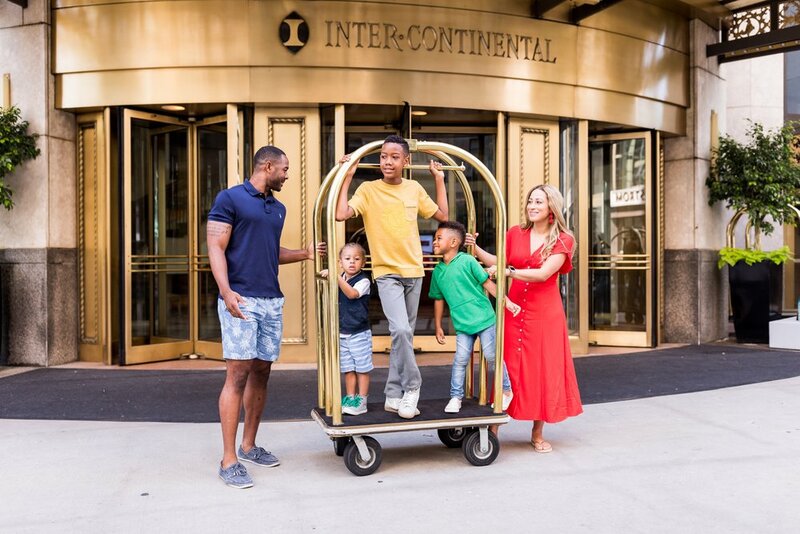 *Thanks to InterContinental Hotel Magnificent Mile for hosting us + the talented Mecca Gamble for the beautiful pictures that we'll treasure forever.